C1440. BRUNO MADERNA Cond. Cleveland S.O. 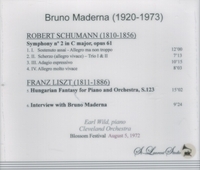 : Symphony #2 in C (Schumann); w.EARL WILD (Pf. ): Hungarian Fantasy (Liszt). (Canada) St Laurent Studio YSL T-359, Live Performance, 5 Aug., 1972, Blossom Music Festival; Interview with Bruno Maderna. [Among the most heartfelt and beautiful interpretations of the Schumann Symphony you'll ever hear!] Transfers by Yves St Laurent. "Liszt was often called a 'piano-centaur', so at one was he with the instrument. Earl Wild could be described in similar terms. The gift of absolute pitch revealed itself at age three as his avidity for the keyboard took prodigious strides. At six he read music fluently, and before he was 12 he was studying piano with Selmar Janson, a pupil of d'Albert and Scharwenka (both students of Liszt). Busoni's 'disciple', Egon Petri; Paul Doguereau, a student of Paderewski and Ravel; and Elena Barere, wife of the phenomenal Russian pianist Simon Barere, provided later tuition. With his superb technique and enormous hands, Wild was predestined to take his place among the great pianists, while his training and place in time spread before him the riches, traditions, and secrets of Romantic pianism. 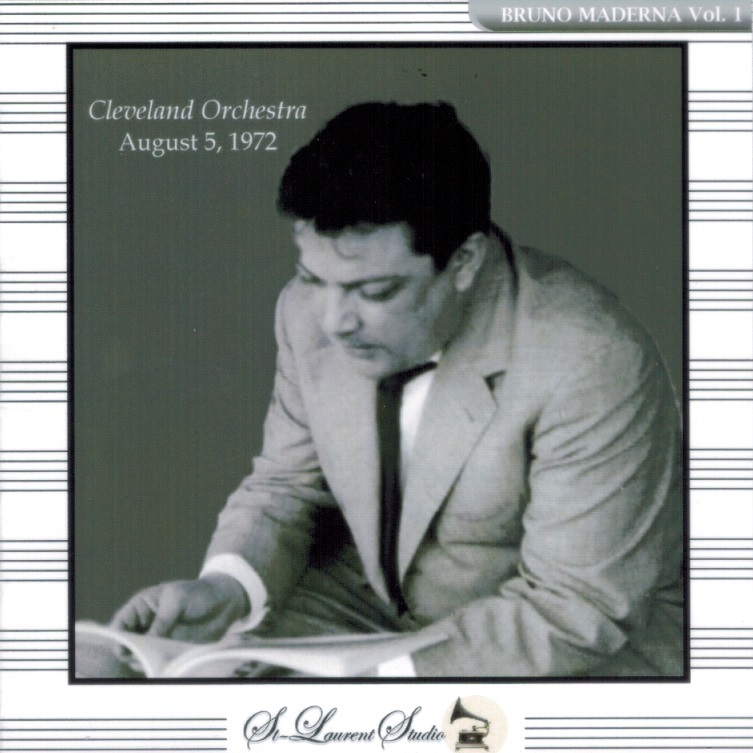 In his early teens, Wild was already composing, arranging, and transcribing music for radio station KDKA in Pittsburgh while playing piano and celesta in the Pittsburgh Symphony under Otto Klemperer. NBC hired him as a staff pianist in 1937, a stint that included playing under Toscanini in the NBC Symphony and with whom Wild gave a legendary broadcast performance of Gershwin's RHAPSODY IN BLUE in 1942, thereby coming to national notice as a major artist. During World War II, Wild served in the U.S. Navy playing fourth flute in the Navy Band, performing recitals at the White House, and frequently accompanying Eleanor Roosevelt to play 'The Star Spangled Banner' on her speaking tours. From 1945 to 1968, Wild was employed by ABC as staff pianist, conductor, and composer. 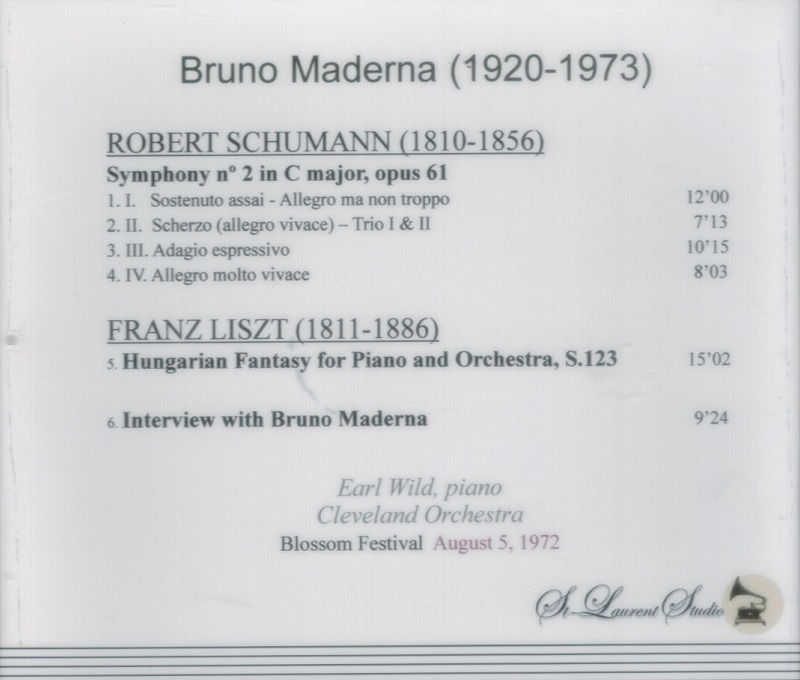 But it was as an interpreter of Romantic literature, especially Liszt - and such neglected figures as Thalberg, Herz, Scharwenka, Balakirev, Paderewski, Godowsky, and Medtner - that Wild was most notable. And, like them, he cultivated the art of piano transcription, re-creating the songs of Rachmaninov and Gershwin in his own omnicompetent style. Since his first recording in 1939, Wild compiled an imposing legacy of recorded performances combining scholarly savoir faire with the flair and visceral impact of the born showman. He was internationally in demand as a teacher."